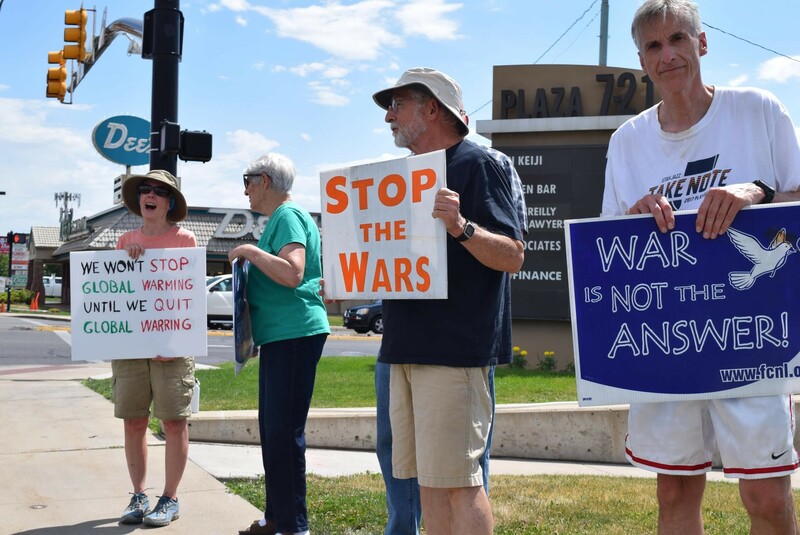 Local group still gathers once a month to protest the U.S. war involvement. Left to right: Meherban Khalsa, Diana Hirschi, Rand Hirschi and Scott Cowan. No matter how big or how small, Diana Hirschi and her colleagues make an effort to stand on a corner in Sugar House once a month to remind the public of America’s war involvement. Hirschi, who was joined by her husband about four other friends, said her war protesting involvement stretches back as far as the Vietnam War. When the U.S. got involved in the recent wars in Iraq and Afghanistan, they started holding weekly vigils at the Federal Building downtown. About five years ago, they moved to their current location where they gather on the first Saturday of each month. Aside from a rainstorm or two, they’ve been out at the corner each month holding signs that say “War is not the answer,” “Stop the wars,” and other phrases encouraging peace.